Attempting to pigeonhole 79.5 into something as narrow as a single genre would be an ill advised, if not impossible task. The New York City band sounds like someone spinning a radio dial with such passionate intensity that all the stations blend together into a single, transcendent, almost spiritual force. It’s disco to the beat of modern house; it’s a Supremes cover of a Cardi B banger; it’s Roland Kirk playing jazz through one saxophone, funk through another, and the most earwormy pop tune the 1970’s could muster through a third. It’s an experience—one so effecting that with only a self-released 12” single in circulation, 79.5 had been written up twice in The New Yorker on the merit of their live sets alone. Their debut album Predictions is produced by Leon Michels and was recorded at The Diamond Mine in Queens the old school way, with the whole band playing the songs in one take and captured to analog tape. They released their now classic Terrorize My Heart 45 in 2016 on Big Crown Records and it solidified all the hype surrounding them. The 7” sold through the first pressing in just a few weeks and became a staple in DJ sets around the world getting spins from the likes of Gilles Peterson, Q Tip, Kenny Dope, DJ Spinna, and Just Blaze to name a few. They announced their debut album via Billboard’s premiere of their newest single Boy Don’t Be Afraid which was accurately described as “Energetic and infectious…a unique, yet easy to listen to experience”. Already getting heavy spins at radio and finding it’s way into the hearts of all the listeners, the instant classic Boy Don’t Be Afraid is as bandleader Kate Mattison describes, “a sweet little song about being. Being hopeful, being romantic, being brave. A romantic stance and a declaration of love through melody, in honest girl-group fashion. And like a classic New York deli cup of coffee, light and sweet”. The album plays very much like their live show, a timeless journey through a New York City dreamscape pulling in the listener to the subtleties of three part vocal harmonies over chords on the Rhodes to the peaks of four on the floor disco drums. Equal parts psychedelic, and folk, gorgeous and gritty. This mix of influences and vibes is maybe best embodied by the stand out tune Facing East which sounds like ESG meets Fleetwood Mac with Sade Saxophone for good measure. Fantasy and I Stay, You Stay touch on love and vulnerability while the drum driven Sister’s Unarmed is 79.5’s politically charged number about how to stand up for equality yet hold on to your gentleness as a person, and specifically as a woman in today’s world. Fireman shows a more sassy side of the ladies, playing on words in a tune many New York women can relate to; one about having a crush on NYC’s Bravest. Wavy is a straight forward good vibe tune about getting out of the city and getting to the beach while the album’s title track Predictions was written by Mattison after having a dream about the apocalypse. The tracks encompass the complexity of the band, sometimes literal and light hearted, sometimes abstract and esoteric. 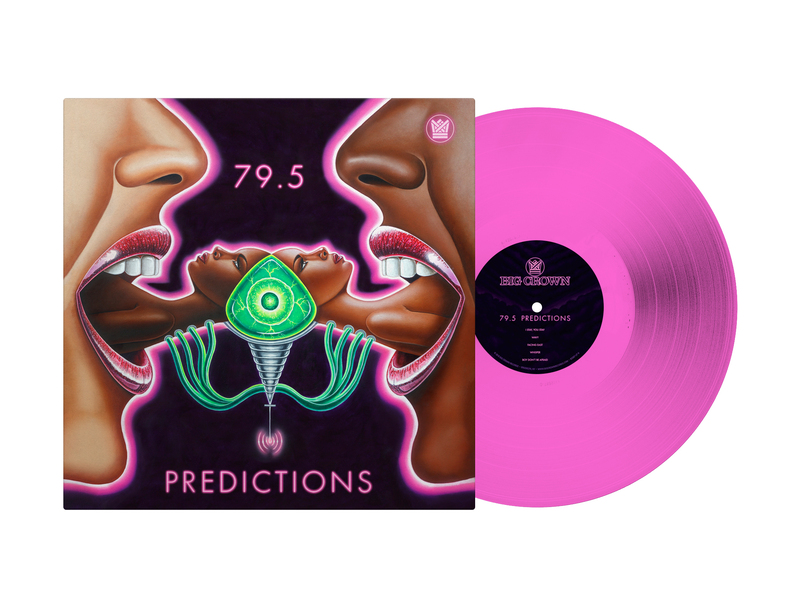 79.5 is easily one of New York City’s most adored acts, their debut album has been eagerly anticipated and will surely supersede fans expectations.